As Britain and the world commemorates the Great War 1914 – 1918, read John Noppen’s first hand account in his recently discovered war diary. John was injurded at the Battle of Neuve Chappelle but survived and his daughter Muriel was a Brentham ‘character’, always to be seen at May Day and cycling on her ancient bike to the shops at Pitshanger Lane. August 1924 and lived there until his death in 1951. 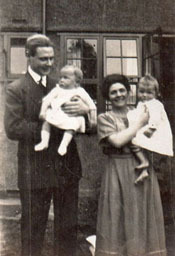 The only surviving member of the Noppen family, Muriel, remained there until shortly before her death age 82 in April 2006. Muriel was a Brentham ‘character’, always to be seen at May Day and cycling on her ancient bike to the shops at Pitshanger Lane. Towards the end of her life, when Muriel was in a nursing home, her neighbour Pat Baxendale retrieved her father John’s war diary from the house. Recognising its historical and local interest, she discussed with Muriel how it could be preserved and made available to a wider readership. Muriel’s wish was that it should be lodged with the Imperial War Museum. Before doing so, Pat and her husband Geoff transcribed the diary, painstakingly checking French and Flemish place-names and deciphering faded, torn and indistinct entries. That transcript is available in full , together with some introductory notes and biographical details about Noppen’s interesting post-war career, and a selection of photographs. Noppen’s diary began on 4th October 1914, the day he left England with his battalion for Flanders, age 26. He wrote entries every day until his admission to hospital in Leicester on March 15th 1915 after receiving wounds at the Battle of Neuve Chappelle.The original diary is now in the Imperial War Museum in accordance with Muriel’s wishes. 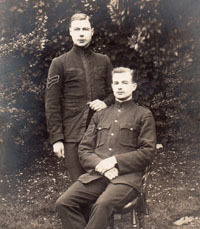 This entry was posted in Archived News and tagged Brentham and the Great War, John Noppen War Diary. Bookmark the permalink.